"Hey, need a fast, easy, crowd-pleasing salad that is easy to play with to suit different tastes? Try this, and you are sure to have a hit!" This recipe tastes better than it looks...but only a little bit. I definetely would not reccommend this to anyone. It looked so unappetizing that I almost didn't even taste it. This was very good and tangy. I'd add cherry tomatoes or red pepper - just something to give it a little splash of color, since a little boring to look at. 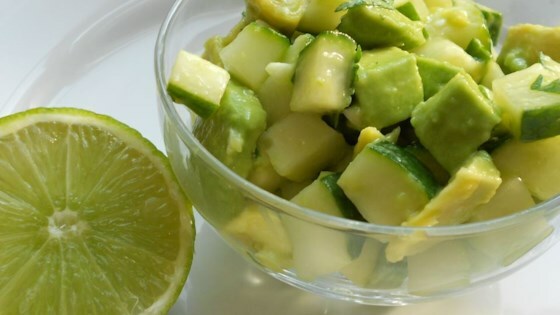 I need to try this recipe again with a riper avocado. It was not bad tasting but it didn't blow me away. I did add some cumin and red pepper to give it some kick.